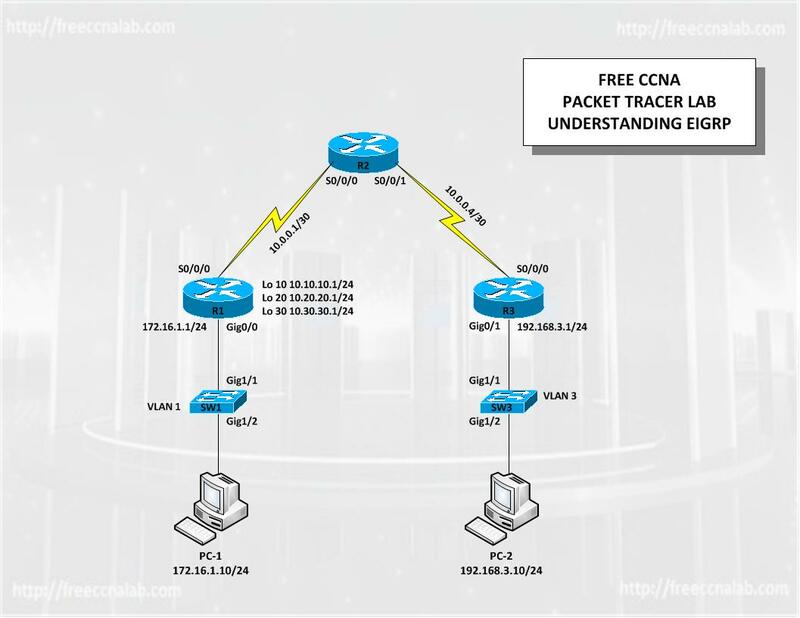 This CCNA Packet Tracer lab has been provided to help you gain a better understanding of how to configure and troubleshoot EIGRP. In this lab we will configure a basic lab topology, enable EIGRP on the routers and configure them to advertise and summaries their subnet. We will also learn to use Cisco IOS show and debug commands to verify and troubleshoot our lab. EIGRP (Enhanced Interior Gateway Routing Protocol) is a network protocol that allows routers exchange information more efficiently than earlier network protocols. EIGRP evolved from IGRP (Interior Gateway Routing Protocol) and routers using either EIGRP or IGRP can interoperate because the metric used with one protocol can be translated into the metrics of the other protocol. EIGRP router keeps a local copy of its neighbor’s routing tables. If it can’t find a route to a destination in one of these tables, it queries its neighbors for a route and they in turn query their neighbors until a route is found. When a routing table entry changes in one of the routers, it notifies its neighbors of the change only. In addition to the routing tables maintained on the router EIGRP keeps a Topology Table. The topology table stores routes that it has learned from neighbor routing tables. Unlike a routing table, the topology table does not store all routes, but only routes that have been determined by EIGRP. The topology table also records the metrics for each of the listed EIGRP routes, the feasible successor and the successors. Routes in the topology table are marked as “passive” or “active”. Passive indicates that EIGRP has determined the path for the specific route and has finished processing. Active indicates that EIGRP is still trying to calculate the best path for the specific route. Routes in the topology table are not usable by the router until they are inserted into the routing table. The topology table is never used by the router to forward traffic. Routes in the topology table will not be inserted into the routing table if they are active, are a feasible successor, or have a higher administrative distance than an equivalent path. To keep all routers aware of the state of neighbors, each router sends out a periodic “hello” packet. A router from which no “hello” packet has been received in a certain period of time is assumed to be inoperative. EIGRP uses the Diffusing-Update Algorithm (DUAL) to determine the most efficient (least cost) route to a destination. A DUAL finite state machine contains decision information used by the algorithm to determine the least-cost route (which considers distance and whether a destination path is loop-free). Review basic router and switch configuration. Enable EIGRP on a router. even though the image shows only one serial connection in the diagram. In the diagram the 10.0.0.5 network does not even exist so I am not sure why it is even listed in the config. Also, the router1 config does not list the loopback interfaces at all that are shown in the diagram. Are you sure you packaged the correct configs with this lab?